This is a handy all purpose knife that is well worth passing down the generations. The blade that has a bit of a drop point is very functional for both game and camp chores. The blade is made of triple laminated stainless steel. The handle of Arv is built up from curly birch, antler and leather, and is deeply contoured for positive control. This is a handy all purpose knife that is well worth passing down the generations. The blade that has a bit of a drop point is very functional for both game and camp chores. The blade is made of triple laminated stainless steel. The handle of Arv is built up from curly birch, antler and leather, and is deeply contoured for positive control. 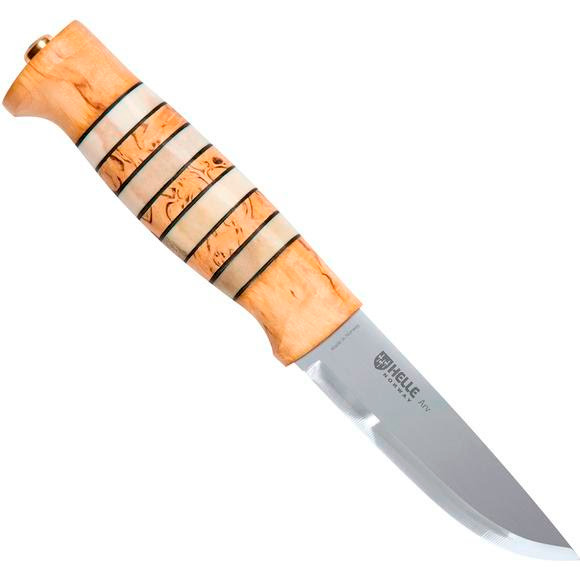 It comes with a sturdy leather sheath of the deep Nordic style.